This what our animals endure all day every day there is an infestation!! The 2013/14 stable fly season continued in the way it began with ongoing severe outbreaks of stable flies. 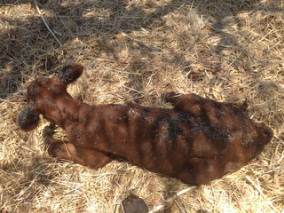 The video below shows a young calf under attack in the Shire of Gingin in early November 2013. 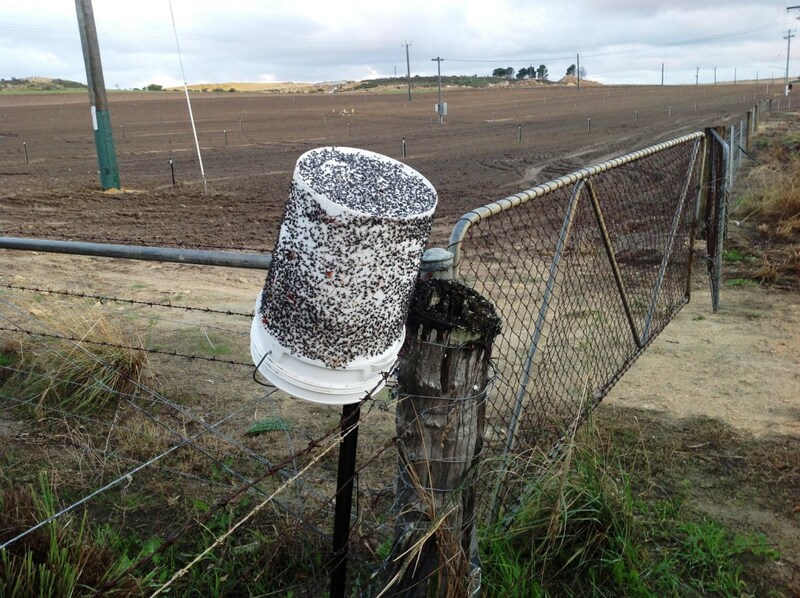 There are now two ways to report stable fly infestations to the WA Department of Agriculture, email and freecall. Despite the new management plan there have been a number of severe outbreaks across the Shire of Gingin and the City of Swan. The Swan Valley and Caraban have been particularly hard hit during the wet and warm spring weather. 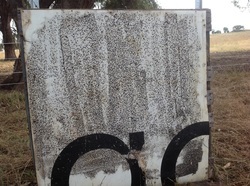 The photo demonstrates the number of flies caught in an hour or so on just one of this property's traps. Let's hope the new inspectors can find the breeding sources quickly. On September 1, 2013, the WA Department for Food and Agriculture (DAFWA) took over responsibility for managing stable fly breeding and the new management plan under the BAM Act came into force in the 12 nominated local government areas. Click here to access a copy of the management plan relating to the use of poultry manure and irrigated horticulture. DAFWA has appointed 3 part-time inspectors to help implement the new regulations. 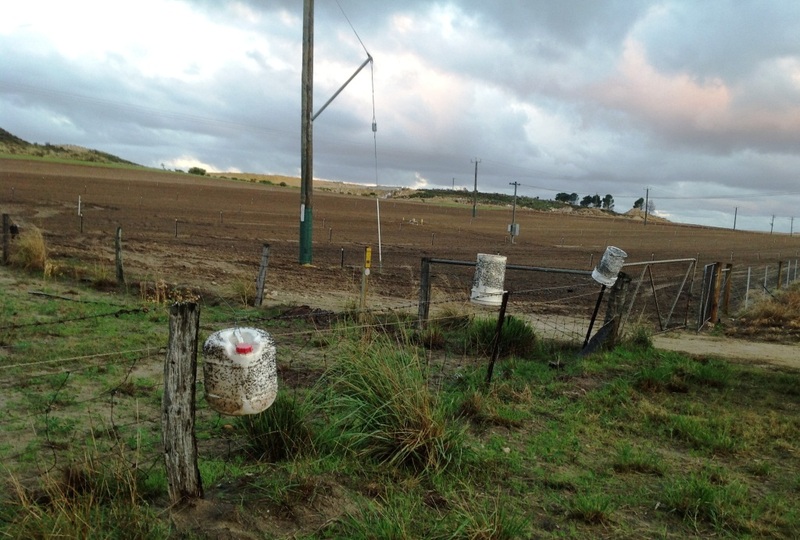 Residents of Caraban in the Shire of Gingin, WA continued to be plagued by severe stable fly infestations during May 2013. 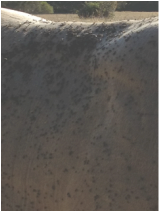 See the photos below showing the number of stable flies trapped on the boundary of a Caraban property in just one hour. Dr David Cook from UWA shared his expertise on stable flies with more than 60 people at Woodridge Community Hall. David provided comprehensive and practical information on different ways of trapping stable flies and protecting livestock and pets from their painful bites. Bob Wilson from SFAG also gave a brief update on how the BAM Act will be implemented. A number of candidates for the forthcoming state elections were in attendance as were officers from the Shire of Gingin. Attendees were requested to sign a petition asking Coles to include control of stable fly breeding in their Quality Assurance Procedures. SFAG members have also reported severe outbreaks of stable flies in Harvey and Muchea over the Christmas and New Year period. Both districts are covered under the BAM Act so let's hope their local councils find the breeding sources here quickly so people and animals don't have to put up with the torment for too long. A number of locations in the Shire of Gingin as well as Bullsbrook in the CIty of Swan are experiencing severe infestations of stable flies which are causing much suffering and discomfort for humans and animals. This photo was taken at Caraban and shows the severity of the outbreak there. Let's hope both councils are able to quickly locate the source of breeding. It's an offence to breed stable flies under both WA BAM Act and the WA Health Act. Please make sure you report any outbreaks of stable flies to your local council so they can deal with the problem. On 3rd December 2012 the Shire of Gingin in partnership with the Waste Management Association of Australia and DAFWA hosted a community forum to discuss issues associated with agricultural organic wastes and to present potential solutions. SFAG committee member Dr Anne Sibbel presented SFAG's perspectives on the breeding of stable flies in organic agricultural wastes such as raw poultry manure and various crop residues. Other presentations were made by officers from DEC, DAFWA, DOH and representatives of the composting, vegetables and poultry industries. After many years of campaigning by SFAG as well as individuals and other community groups, SFAG are very pleased that the Minister for Agriculture, Terry Redman, has recognised the severity of the impacts of stable flies on livestock and humans and today announced stable flies have been declared a pest under the Biosecurity in Agriculture Act (BAM Act) in 12 local government areas. This represents the first ‘new’ pest that has been declared under the BAM Act. SFAG are also pleased that the Management Plan that accompanies the declaration will provide a specific framework for managing the breeding of the biting stable flies, while the associated penalties will provide a deterrent. While it is acknowledged we won’t ever be able to totally eradicate this pest, declaring them under the BAM Act should lead to a reduction in their numbers and lessen the misery that livestock and humans go through each year. Special thanks are extended to everyone who has supported SFAG’s recent campaign. This includes Hon Grant Woodhams MLA, Hon Alison Xamon MLC, Hon Frank Alban MLA, Hon Sally Talbot, MLC, Hon Paul Papalia MLA and the Shire of Gingin. This announcement coincides with the start of a research project being headed by Entomologist Dr David Cook, which will investigate further ways of managing breeding of stable flies in vegetable crop waste. The Chairman of SFAG, Bob Wilson said “this represents the culmination of 20 years of lobbying by various effected parties who have spent countless hours trying to get the government to take action on this horrendous problem. We look forward to the government backing up this announcement with suitable financial support and resources”.